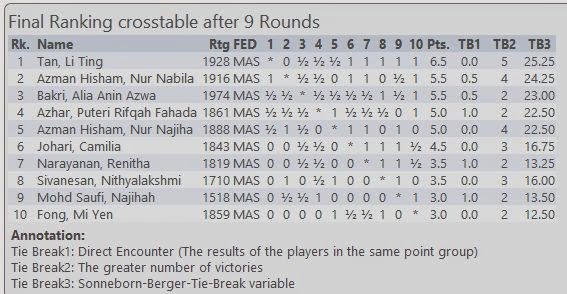 Our 16 year old current National Junior Champion Tan Li Ting today added the Malaysian Masters title to the National Championship she won when just 12 years of age. In the end it was a convincing victory helped by several of her main rivals imploding under the pressure of ensuring their qualification for the Tromso Olympiad but all credit should go to a determined young player who after a normal start, suffered a big loss but then made up for it with a series of wins to pile on the pressure. Having become the only player to qualify with one round to spare, it was just a question of nailing the championship with the advantage of the white pieces. Top seeded Alia Anin Azwa Bakri who has been very active recently, played solidly to be the only undefeated player and so successfully returns to strengthen the national team while last year's Masters champion Camilia Johari will sadly miss out. While the Azman Hisham sisters remain amongst our best young players it is clear that many from their golden generation have now caught up, lacking only their experience and arguably all needing better coaching, and so other than being another more recent wake up call for them, I am curious if anything can be done to ensure this group can be retained and even expanded further and be made more successful.